Paul Auster’s New York Trilogy has been waiting for a review for a few weeks now. I can confidently say that I’ve never read a more confusing, unresolved book than this one. What’s incredible about Auster’s work, though, is that this doesn’t condemn the book in any way. If you’re a fan of neat and easy storybook endings that are predictable from a million miles away, stay away from The New York Trilogy. If you like great writing that gives you a headache, this is the novel for you. City of Glass: As a result of a strange phone call in the middle of the night, Quinn, a writer of detective stories, becomes enmeshed in a case more puzzling than any he might have written. Ghosts: Blue, a student of Brown, has been hired by White to spy on Black. From a window of a rented room on Orange Street, Blue keeps watch on his subject, who is across the street, staring out of his window. The Locked Room: Fanshawe has disappeared, leaving only his wife and a baby and a cache of extraordinary novels, plays, and poems. What happened to him — and why is the narrator, Fanshawe’s boyhood friend, lured obsessively into his life. None of these stories follow any traditional pattern. City of Glass fizzles into existential questioning at the expense of any action. Ghosts comes to a surprising head, and is marked by the total non-characterization of its colorful characters. The Locked Room appears to be a regular mystery story, until the narrator inherits Fanshawe’s wife and life, and is wracked by dread when Fanshawe seems to have reappeared. None of these stories are an easy read, or go in the direction that you expect. Also, they make absolutely no sense. All of the stories feature intriguing overlaps. Characters have the same or similar names, patterns of events repeat, and the red notebook is frequently seen. Obsession and identity are key themes across the trilogy. In the end, all three stories hang together in such a way that they’re inextricably unrelated. There are no spoilers to give away because you will finish the book without a clue of what happened. 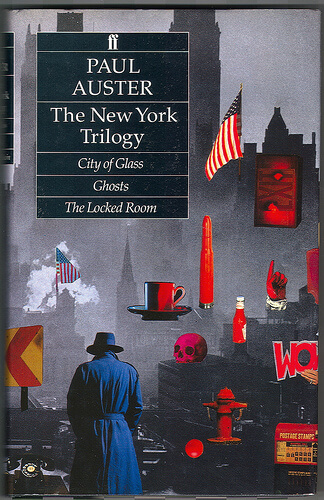 Many people dislike Auster and his work for this reason, but I found something intriguing under the surface of The New York Trilogy. Auster is writing in unfamiliar territory, and he doesn’t have all the answers himself. The book could even be seen as partially autobiographical. Paul Auster is actually a character in multiple stories, and the book expertly blurs the line between reality and fiction. It makes for an intensely entertaining and thought-provoking read. If you read The New York Trilogy, you will find yourself obsessed the entire time you are reading it. 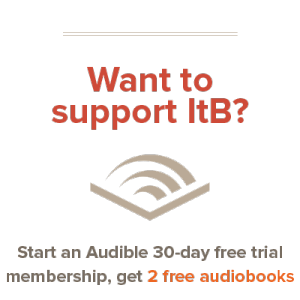 Just like the characters in the stories, you will throw books, pace and debate what is true, and find yourself increasingly obsessed with understanding what is going on. Auster has accomplished one thing for sure: whatever this book is about, it’s exciting enough to totally enmesh its readers in its world. I’m looking forward to putting more time into decoding the meaning of the story — I have lots of notes, but no answers yet!